Jack Bauer was born in California as the son of Phillip Bauer. After high school, he enrolled at UCLA, where he graduated with a bachelor's degree in English Literature and Art. He went on to receive his Master of Science in Criminology and Law from UC Berkeley. After completing his schooling, he was in the U.S. Army's elite special forces unit Delta Force, and worked as a Los Angeles Police Department SWAT team member. Bauer also did fieldwork for the Central Intelligence Agency before being seconded to the Counter Terrorist Unit. While at CTU, he was the Team Leader for an action known as Operation Proteus and the Section Captain during the incident of the Hotel Los Angeles attack. He later uncovered evidence that three CTU agents, including his mentor Christopher Henderson, were taking bribes. Jack gained a reputation as a whistleblower and lost favor with CTU hierarchy. Jack was married to Teri Bauer; the couple had one daughter, Kim Bauer. After Teri's death by the hands of Nina Myers, a rift grew between Kim and Jack, not closing until eighteen months later. Jack also broke off contact with his father, Phillip Bauer shortly after the funeral. He and his brother Graem Bauer have been cold towards each other since Jack had an affair with his wife. They hadn't spoken in nine years. Throughout the course of 24, Jack has been the subject of "blowback" (when a past operation comes back to haunt him in some way) a total of four times. The first was in Day 1, with Jack being the target of the Drazen family (also targeted: Senator David Palmer and Robert Ellis). The second was in Day 3, with Jack's former Delta Team soldier, Stephen Saunders, releasing a weaponized virus in the United States. The third occurred in Day 5, when Jack was abducted by Cheng Zhi after taking part in a covert operation on the Chinese Embassy in Day 4. The latest blowback occurs in Day 6, when terrorist Abu Fayed demands Jack's death after Jack tortured and killed his brother in Beirut during an operation in 1999. The way to my heart.. 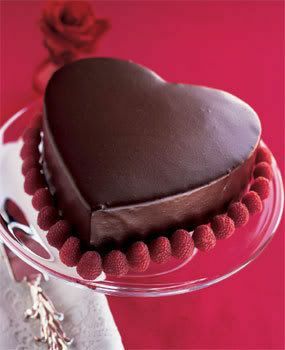 I love chocolate and this cake would win me over!!! Look for the heart-shaped cake ring at cake and candy supply stores, or call Jane's Cakes and Chocolates at 800-262-7630. You can also use a buttered and floured 8-inch round cake pan with 2-inch-high sides. Preheat oven to 400°F. Place 8x8x2-inch heart-shaped cake ring on sheet of foil. Wrap foil up sides of ring. Brush foil and inside of ring with 1 tablespoon butter; dust with flour. Place on baking sheet. Sift flour, cocoa, and salt into medium bowl. Combine eggs and sugar in large metal bowl. Set bowl over saucepan of simmering water (do not allow bottom of bowl to touch water). Whisk until sugar dissolves, about 2 minutes. Remove from over water. Using electric mixer, beat mixture until thick and billowy and heavy ribbon falls when beaters are lifted, about 5 minutes. Sift half of dry ingredients over; fold in gently. Repeat with remaining dry ingredients. Transfer 1/4 cup batter to small bowl; fold in 3 tablespoons butter. Gently fold butter mixture into batter; do not overmix or batter will deflate. Transfer batter to ring. Bring whipping cream and cinnamon sticks just to simmer in heavy medium saucepan. Remove from heat; let steep 1 hour at room temperature. Cover and refrigerate cinnamon cream overnight. Blend jam and kirsch in small bowl. Cut around sides of cake; lift off ring. Using metal spatula, loosen cake from foil and transfer to rack. Using serrated knife, cut cake horizontally in half. Using tart pan bottom, transfer top cake layer to work surface; turn cut side up. Spread half of jam on cut side of both cake layers. Strain cinnamon cream into large bowl; beat until soft peaks form. Stir finely chopped chocolate in heavy small saucepan over low heat until smooth. Quickly fold warm chocolate into whipped cream (chocolate must be warm to blend smoothly). Immediately drop mousse by dollops over bottom cake layer; spread to within 3/4 inch of edge. Gently press second layer, jam side down, atop mousse. Smooth sides of cake with offset spatula. Chill assembled cake on rack while preparing glaze. Bring cream, 1/4 cup water, corn syrup, and tea to boil in small saucepan, stirring constantly. Remove from heat; steep 5 minutes. Strain into another small saucepan; return to boil. Remove from heat. Add coarsely chopped chocolate; whisk until smooth. Cool glaze until thickened, but still pourable, about 30 minutes. Place rack with cake over baking sheet. Slowly pour glaze over cake to cover, using spatula if necessary to spread evenly. Chill until glaze is firm, at least 2 hours and up to 1 day. Place cake on platter and serve. IT TAKES SOME TIME AND IS A LITTLE COMPLICATED FOR SOMEONE NOT TOO FAMILIAR IN THE KITCHEN. 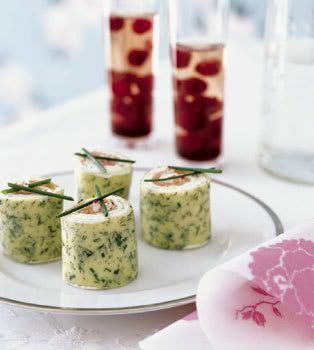 HOWEVER, IT IS A DELICIOUS GOURMET APPETIZER!! All but the most experienced of crêpe chefs will admit that the first crêpe in a batch is often not of the best quality. The level of heat under the skillet needs to be fine-tuned as you go. With that in mind, our recipe makes enough batter for 2 crêpes, even though you'll only need 1 for this hors d'oeuvre. If the first crêpe comes out well, freeze the extra, wrapped tightly in plastic wrap, to use another evening. Blend milk, flour, egg, and 2 teaspoons oil in a blender until smooth. Add chives and dill and pulse 1 or 2 times to just combine. Chill batter, covered, 30 minutes. Stir batter to redistribute herbs. Lightly brush a 10-inch nonstick skillet with oil, then heat over moderately high heat until hot but not smoking. Holding skillet off heat, pour in half of batter (1/4 cup), immediately tilting and rotating skillet to coat bottom. (If batter sets before skillet is coated, reduce heat slightly for next crêpe.) Return skillet to heat and cook until crêpe is just set and pale golden around edges, 10 to 15 seconds. Loosen edge of crêpe with a heatproof plastic spatula, then flip crêpe over carefully with your fingertips. Cook until underside is set, about20 seconds more. Transfer crêpe to a plate. Make another crêpe in same manner, brushing skillet again with oil. Stir together cream cheese, lemon juice, zest, and pepper in a small bowl until smooth. Put 1 crêpe, browned side up, on a work surface, and spread with all of cheese mixture. Arrange salmon in an even layer over bottom half of crêpe (side nearest you), then scatter radishes over salmon. Beginning at bottom, tightly roll up crêpe, then cut roll crosswise into 4 pieces, trimming ends if desired. WASHINGTON (Reuters) - People who use large amounts of skin-numbing creams and lotions, often in conjunction with cosmetic procedures, are at risk of irregular heartbeats, seizures and even death, U.S. health officials warned on Tuesday. Food and Drug Administration, citing two deaths, said such topical anesthetics can be applied in amounts so large that a lethal dose of the chemicals can enter the bloodstream. After the procedure, "these women then wrapped their legs in plastic wrap, as they were instructed, to increase the creams' numbing effect. Both women had seizures, fell into comas, and subsequently died from the toxic effects of the anesthetic drugs," the FDA said. Numbing creams and lotions, available both by prescription and over the counter, are approved to soothe burning or itching skin as well as pain before, during and after various procedures. They contain numbing drugs that can include lidocaine, tetracaine, benzocaine and prilocaine. But the FDA said consumers should be cautious about using them without medical supervision. Leaving the creams on the skin for long periods of time or on large portions of their bodies can increase the risk, officials have said. Small children and people with heart or severe liver disease are also at higher risk. People considering skin-related cosmetic or medical procedures should talk to their doctors about whether they need numbing creams, the agency said. If so, they should use one that is FDA-approved and contains the lowest amount of anesthetic possible. "You should also discuss with your doctor whether there are other ways to reduce the pain you may feel during the procedure," it added. My son gets sick every now and then but his fever today is 103! His whole body is like a heat rock and his cheeks are rosey red. He is coughing and throwing up after he coughs. I took him to the doctor yesterday and had such a hassle getting to see our regular physician. They said , "she leaves at 11:30 but we can squeeze you in at 11." Ok, we get there at 11 and waited until nearly 12 just to see her. Then we only see her for less than 5 min. and leave with no prescription because he only has a viral infection and not a bacterial one. It was a little frustrating but I do not trust any other doctor. How does Hoodia Gordonii work to supress your appetite? There are many known species of Hoodia, but the Gordonii species is the only one that contains the powerful all-natural appetite suppressant properties. A molecule named P57 is the active ingredient in Hoodia; it acts on the hypothalamus (the area of the brain that controls appetite and hunger) to "trick" the brain into thinking that you have already eaten and that you are full. When you eat, food is converted into glucose (sugar), which acts on the brain to trigger the "full" feeling. The P57 in Hoodia acts in the same way, but the difference is that it is about 10,000 times more powerful than glucose is, so even small amounts of P57 can fool the brain into thinking that you have eaten and that you are full. After taking Hoodia, people have reported feeling full more quickly when eating, a delay in the time after eating before feeling hungry again, a reduced interest in food and eating, and a general feeling of well-being; and all of this is without any known unwanted side effects. WHAT CONCERNS ME IS THAT I AM NOT SURE IF I WANT A PILL WORKING ON MY BRAIN TELLING IT SOMETHING THAT IT IS NOT. I THINK I WOULD LIKE TO SEE THE MEDICAL RESEARCH RECORDS AND PROOF THAT THIS THING ACTUALLY DOES WHAT IT SAYS IT DOES.